Oh. My. Goodness. 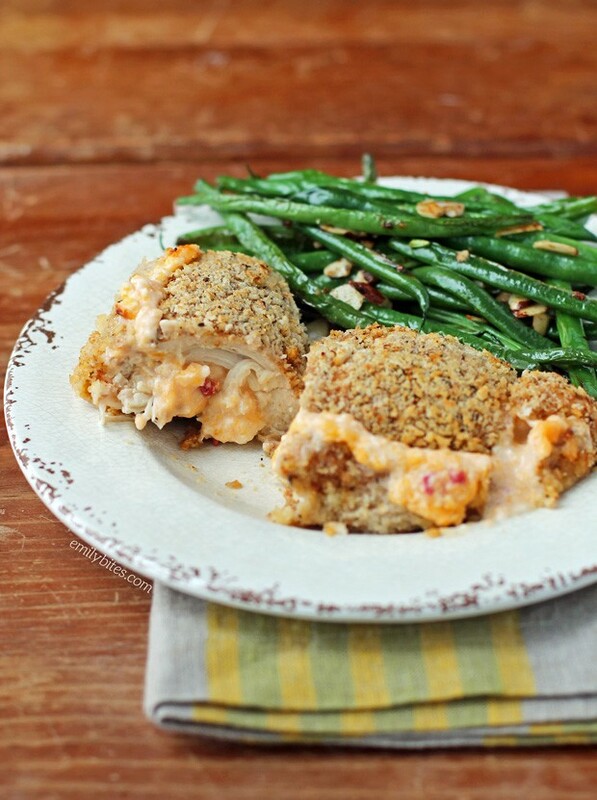 This Pimento Cheese Stuffed Chicken is positively swoon-worthy. I’m obsessed! 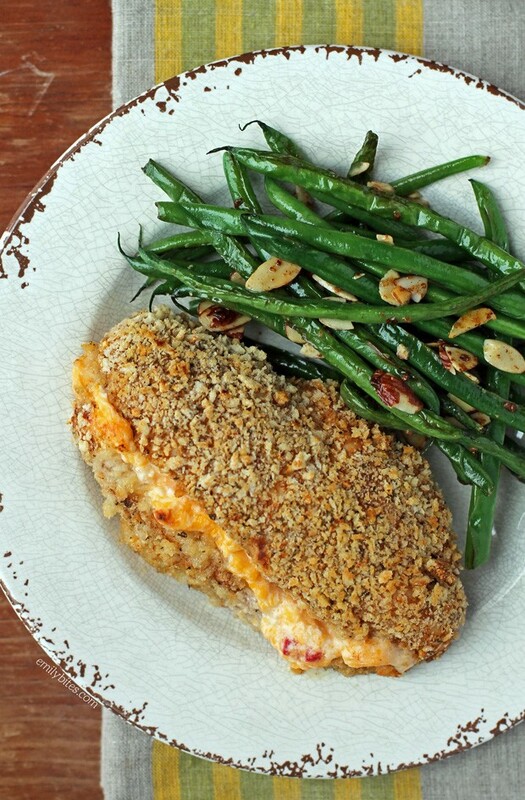 The Cajun panko coating is crunchy with just the right amount of kick, and the warm, creamy pimento cheese oozes out of the chicken with each bite. If you’re unfamiliar with pimento cheese, it’s a Southern classic that mixes cheddar cheese, mayonnaise, pimiento peppers (the ones you may know from being stuffed in green olives), and other seasonings and ingredients depending on who is making it. It’s amazing straight up or as grilled cheese filling, a burger topping, or countless other ways…like stuffed into this chicken! 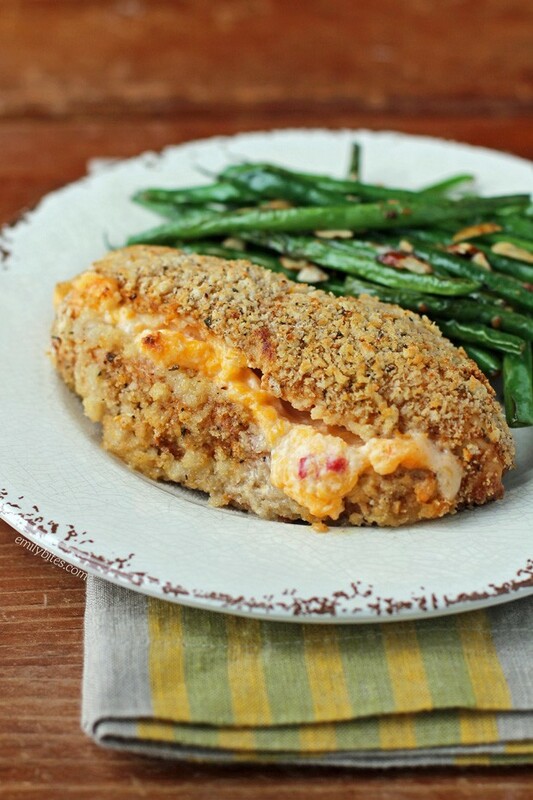 This Pimento Cheese Stuffed Chicken is very filling (it’s a large serving!) and it pairs perfectly with a vegetable side (like the green beans and almonds pictured here). It comes together quickly and easily and tastes so decadent no one will ever believe it’s only 344 calories or 6 Weight Watchers SmartPoints! This chicken can be an easy weeknight meal or a perfect main course to serve company as it’s sure to impress! The recipe can also be easily halved or doubled, depending on how many you’re serving. Looking for more ways to make your chicken breasts delicious? Try my Antipasto Chicken Roulades, Cream Cheese Stuffed Everything Chicken, Cheesy Bacon BBQ Chicken, Cheddar Ranch Chicken Tenders, Pesto Chicken Roulades, Lemon Pepper Iced Tea Chicken, Cheesy Chicken and Stuffing, Pizza Chicken Roulades,Thai Chicken Skewers, Chicken Piccata, Slow Cooker Buffalo Chicken and many, many more in the chicken section of my recipe index! Pimento Cheese is sooo delicious, and hugely popular in KY. It’s usually spread on fancy finger sandwiches for showers, etc. 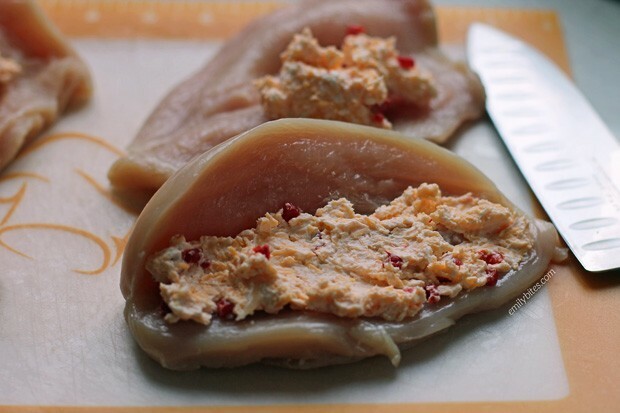 What a terrific idea to put it into chicken breasts! This chicken sounds outrageously yummy, so I’ll definitely be making it very soon (and I won’t change a thing). My mouth is watering! What keeps the cheese from just sort of pouring out of the breasts, since they’re cut almost through? Do they need to have a toothpick or something run through the cut edge to hold everything together? Love, love pimiento cheese–especially when it has some jalapenos in it! It’s delicious over a hamburger, and makes a wonderful grilled cheese sandwich. I just made sure I left a little space at the edge of the cut part so that when the filling got melty it had somewhere to go. Once you fold the top of the breast back over the filling it should be fully enclosed (not visible). If the cheese oozes out a little bit that’s okay! Whenever I’ve made it the majority of it stays in there. If you’d like to seal the edges with toothpicks you can certainly do that as well. Hope you enjoy it! WOW! I replaced the 2% cheddar with full fat Gouda (now that I hit my goal and am on a maintenance plan I can enjoy little indulgences like this), and I was blown away! I am not usually crazy about chicken but this is my new fav Emily Bites recipe (and I’m a huge fan!) Delicious! I did find that it’s not half as good reheated, probably bcuz the cheese doesn’t get as melty, so I suggest adjusting the portions and only making what you need that night. This was so delicious! I skipped the browning in oil step and cooked them in my air fryer on 370 for 25 minutes total (flipped after 15). Will definitely be making them again!!! WOW. Holy cow. That was delicious!! !